Stage LED display is also called stage background LED display which is usually installed in the places such as stage, theme show, wedding, concert, large-scale concerts, music tour, road show, fashion shows and so on. UNIT Stage Rental LED display are good well designed, stable, reliable, portable, beautifull, high quality LED display products. They come in various sizes and pixel pitch, offering shocking display effect and vivid image and visual experience to viewers. Portable and easy to transport: stage LED display is designed with ultra light cabinet for easy transport and quick assembly and disassembly in a few seconds. Resolutions: stage LED display is available with a pixel pitch of P2.98mm (3in1, 112608 dots/m2), P3.91mm (3in1, 65746 dots/m2), P4.81mm (3in1, 43264 dots/m2), 2.604mm (3in1, 147456 dots/m2), P2.84mm (3in1, 123904 dots/m2), P2.976mm (3in1, 112896 dots/m2), P2.84mm (3in1, 123904 dots/m2), P5.95mm (3in1, 28224 dots/m2), P6.25mm (3in1, 25600 dots/m2), P2mm (3in1, 250000 dots/m2), P2.5mm (3in1, 160000 dots/m2), P3mm (3in1, 111111 dots/m2), P4mm (3in1, 62500 dots/m2), P5mm (3in1, 40000 dots/m2), P6mm (3in1, 27778 dots/m2), P10mm (3in1, 10000 dots/m2). Cabinet Size: Our stage LED display come in a comprehensive range and variety of sizes, offering 500×500mm (for pixel pitch is P2.98, P3.91, P4.81, P2.604, P2.84, P2.976, P3.91, P4.81, P5.95, P6.25),500×1000mm (for pixel pitch is P2.98, P3.91, P4.81, P2.604, P2.84, P2.976, P3.91, P4.81, P5.95, P6.25), 512×512mm (for pixel pitch is P2, P4), 480×480mm (for pixel pitch is P2.5), 576×576mm (for pixel pitch is P3, P4), 640×640mm (for pixel pitch is P5), 960×960mm (for pixel pitch is P10, P8, P5, P6.67). Excellent Visual Experience: UNIT stage LED display adapts high quality LED lamps, 5024 driver IC and Nationstar LED to ensure LED display high definition, High refresh rate, high contrast, high gray level to meet the need of stage broadcast and requirements of live. 16bit Image Processing: UNIT stage LED display Grayscale up to 16bit. Which can easily meet the requirement of live broadcast, stage, rental and other high-end applications such as montor room, TV studios, and so on. Fresh Rate: UNIT stage LED display use latest SMD 3in 1 techology, the led display refresh rate can be up to 4800Hz. Rich and vivid High difinition images give people an immersive audio-visual feast. Dual Service (Front and Rear): UNIT stage LED display can be designed with two maintenance ways include front service and rear service. For front service way, we call it as front service or front maintenace LED display, which can save you much time and labor when the LED display moduels is bad. Signal processing: Equips professional LED display video processor and audio, video processing system. 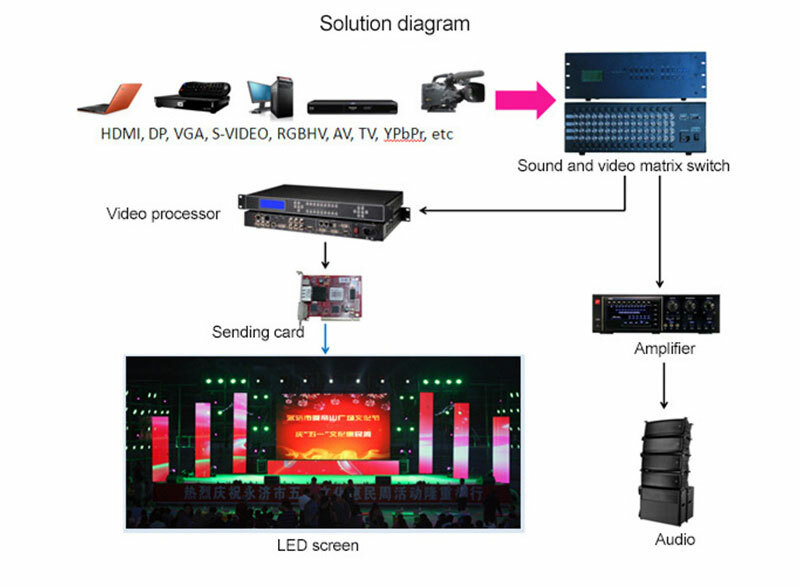 UNIT stage LED display can support various video input signals such as YUV, SDI, VGA, DVI, HDMI, composite and so on. Various image and video content format is supportable. Have a Project for us? Get in touch!